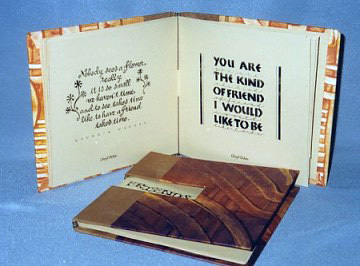 This book of friendship quotes contains reproductions of calligraphy from the Her Nibs 1997 and 1996 Calendar. Thanks to my dear friends for their permission to use these quotes for this project, their inspiration, creativity, and encouragement. Materials: paste paper, book board, fabric, waxed thread, PVA and methyl cellulose. Book 6" x 6" (15.2cm x 15.2cm).